It is pumpkin season! This is my favorite time of year and there is no better place than Petaluma to enjoy the autumn bounty and the growing number of activities and attractions that go along with it. The pumpkin patches start to open this weekend and promise weeks of festivities and entertainment to keep you and your family busy; whether you want to pick a pumpkin to bake a pie or take the kids on a fun-filled day of farm animals and inflatable rides. *Pack some water for the hot weather days in the beginning of the month, when you can pick pumpkins in a tank tops and shorts. *Be ready with rain boots and umbrellas by the end of the month, when we frequently start to get rain; and call the patches ahead of time to make sure they are open in wet weather. *If you are worried about being chased by a stray bee here and there, I am told that affixing a drier sheet to your shirt will keep them a bay! A mind-boggling array of fall fun! Seven days a week you can pick your own pumpkin and haul it back in a wheelbarrow, visit farm animals, check out the antique tractor display, and tackle the family-friendly corn maze ($5 per person). On the weekends enjoy the Spider Hollow Haunted Barn, giant inflatables (starting Oct. 8th ), party jumpy house, pony rides, face painting, custom balloon creations, and a visit from the Pumpkin Fairy Godmother (Starting Oct. 8th, she rises out of the pumpkin patch to tell stories and sprinkle fairy dust on your pumpkins!) Other weekend activities include the Adobe Farmers Market, hay rides, cow milking, 4H groups, entertainment and music, and food vendors. Shop the growing Adobe Marketplace: Farmer’s Wife Barntique, Halloween Barn, Coffee Barn, Christmas Shoppe, and the NEW Heebee Jeebee Halloween Outpost. Admission is free. Attractions are $2-$5. Special events include the Adobe Pumpkin Festival (Oct. 15th & 16th, benefit for the Petaluma Educational Foundation), Open Air Event (Oct. 15th & 16th, 22nd & 23rd ), Celebrating Farming Weekend (Oct. 22nd & 23rd). Check the website for more details. Loads of fun packed into this organic family farm; a good choice for families with small children! 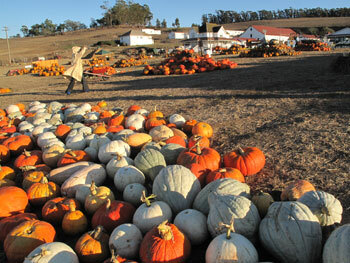 Pick your own pumpkins; they have both cooking and carving varieties on the vine. Ride their Halloween train or take a bouncing hay bale ride around the farm. Climb the hay pyramid and play in the hay maze/tunnel. Get lost in the corn maze (it took us about 20 minutes to escape last year)! Visit the farm stand offering a variety of pumpkins, gourds and organic vegetables, including some uncommon varieties of melons. Admission free. Train ride, hay ride, and corn maze are each $5. A new addition to the Petaluma Pumpkin Patch scene! Pick from three acres of pumpkins, from mini to giant, pet farm animals, and watch cows being milked. Visit the farm store for farm fresh goods, including free-range eggs, European Style Organic Artisan Butter and lavender. Stay for a 1:00 pm tour of the dairy farm where you learn about the farm and animals, pet babies, and milk a cow by hand. Admission to the pumpkin patch is free. Tours are $10 for 13 and older, $7 for 4 to 12 year olds, and free for 3 year olds and younger. Reservations recommended for dairy farm tours as the do sell out! Weekday mornings are for school groups, by reservation only. A favorite family farm that is great for small children! Grab a wagon and pick your own pumpkin. They have a variety of pumpkins, including ones that are good for cooking; new for this year are large white Polar Bear pumpkins! Visit the farm animals and watch bees in their observation beehives; buy some fresh honey (while it lasts). Take home some giant sunflower heads to use as birdfeeders. Also available are fresh tomatoes, eggs, and Kubota squash. Admission free. Every year, this pumpkin patch heralds the pumpkin season as I watch the pumpkins and corn maze grow from Highway 101. Famous for their 4-acre A’Mazing corn maze, newly designed each year (free for kids under 5, $6 for ages 6 and over); Friday/Saturday “Night Maze” ($9, 6-10pm). Choose from over 50 varieties of pumpkins for cooking or carving (including pick-your-own), 9 varieties of gourds, and 16 varieties of squash. Free admission to the huge straw mountain, farm animal petting zoo, and little kids maze. For a fee activities include jumpies/inflatables (smaller ones during the week, large/interactive ones on the weekends), and weekend pony rides. Special events include bake sales, face painting, Budderball the Clown, animal demonstrations, and local food vendors. Check the website for details. School tours available by reservation. Plenty of wholesome fun to be had at this lovely farm and dairy! Every day of the week you can pick your own pumpkin, enjoy tractor rides, dig for potatoes, taste cheese, try fresh made ice cream, milk a cow, wind your way through the hay maze, and climb the hay pyramid. On the weekends they will also have bands (call for details), stage coach rides, and the Pasta King serving lunch in the afternoons (last 2-3 weekends in Oct). Activities are free. School and group tours available by reservation. This increasingly popular festival has never failed to provide a fun-filled day for our family! Take in the beauty of Tolay Park while you enjoy a variety of fun activities. Native American Village with demonstrations, “From Earth to You” hands-on children’s area, Kiddie Corral, Night Time Creatures Barn with Creepy Crawly Critters room, live animals and nature hikes. Take a ranger-led tractor ride to the pumpkin patch. Pick from a fall bounty of gourds, squashes, colorful corn, and more. Participate in the World Record Pumpkin Seed Spitting Competition. Admission is $4 for ages 13 and up, $1 for ages 12 and under. Parking is $6 per car, or free with a park pass. See website for more details. I love this, very useful. Thanks! 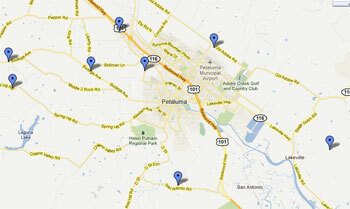 After reading these reviews we went to the Petaluma pumpkin patch. We were having a good time until one of my kids broke a hole on a small dried gourd. He brought it to me and as I was asking him what had happened, a man who turned out to be the owner of the pumpkin patch nastily and sarcastically said that “yes there was a problem and that I should watch my children.” I apologized and said I would pay for the gourd he shook his head and walked away. I have three well behaved little boys. One of which I was holding at the time and this mans anger over this Gourd! made them start crying. When I calmed them down I went back to tell him how much he upset them. He wasn’t interested. He yelled at me again. And then went back to guarding the ATM. Before this happened we had spent $45. On the maze. And jumpy house alone. Other people had unhappy kids because they couldn’t afford $10. For the jumpy house. Don’t go! Its A circus and they don’t appreciate the business.